Should We Care For Some People More Than Others? 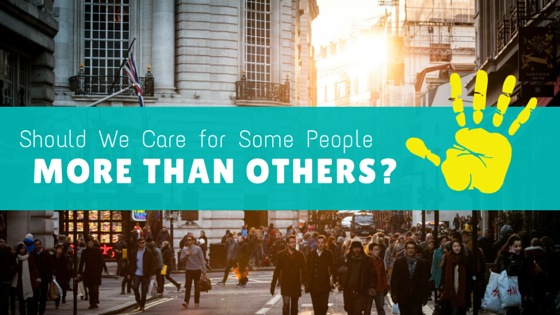 With the exception of the odd Ebenezer Scrooge, most of us agree we should care for others. But is there an order? A “priority sequence”? With a question like this, it’s easy to sing platitudes. But I’ll be honest: before I even look at what the biblical writers have to say I already know I have a priority sequence. If you’re living under my roof you get more of my care than anyone else. But is it right? What about Jesus’ command to “Love your neighbour as yourself”? Am I supposed to care for the person I just met in the mall as much as my own son? That didn’t fully happen, of course. But the passages keep pouring in that talk about caring for others, especially the poor and marginalized. We can assume he was directly addressing male leaders of the family who, especially in the 1st century, had responsibility for ensuring needs were looked after. Then, toward the end of his fiery letter to the Galatians, Paul stresses the importance of “doing good to all people, especially to those who belong to the family of believers” (Galatians 6:10). So to this point, is this the priority sequence when caring for others? I’m sure people will react differently to this list depending on their perspective and experience. If you’ve been neglecting your family, maybe this’ll make you pause and re-fuel in a big way. If you don’t take seriously your high calling and responsibility to care for others in your church, maybe you’ll pray and rethink a few things… or many. And if you’ve limited your care-giving to family, or those who you like, or those who are like you, hopefully you’ll pull up your boot straps and stretch your mercy-making horizons. But those passages aren’t all. Let me bring it in with Jesus’ words. As I often say: What God’s Son says goes. So in my approach, all ideas needs to be illuminated by him. Jesus seems to trump all these ideas with his radical love-your-neighbour-as-yourself command. He instructs us to love all people, including enemies, with a love we would normally only reserve for ourselves. And he even stresses (in 3 of 4 gospels) that his true family is those who do God’s will. I think of Mary. Yes, she knew Jesus was destined for earth-shattering and God-honouring things—but that must have been difficult for her to hear as a mom. And yet, when Jesus was on the cross—arms outstretched, body surely pulsating with pain, defeating death, paying the price for your brokenness and mine, playing the decisive move in God’s global renovation project—he asked one of his followers, John, to care for his mom when he was gone. He wanted to ensure his biological family was cared for. Then there’s the famous story of the Good Samaritan. Let me wildly condense it for you: Your neighbour is anyone—anyone at all—who is in need. So that love-your-neighbour-as-yourself thing is underlined and highlighted with God’s pen. That makes me want to tattoo it on my heart. Of course, if the biblical writers or Jesus carry no weight in the machinations of your mind, or if you think, along with Professor Stephen Hawking, that “the human race is just a chemical scum on a moderate size planet,” then you may have other thoughts. QUALIFIER: In addition to loving God first in everything, we are called into ascending greatness by loving our neighbours—anyone in need—as ourselves. For many of us, the moment the bulb over our heads flicks on is when we realize our love can go the distance for others because God’s love has gone the distance for us. Click here to sign up for “Up!” — my daily uplift delivered to your email inbox 5 days a week.